Join the discussion on our forums! Come discuss Kirin Tor Tricaster over in our dedicated Kirin Tor Tricaster discussion topic. Spell Damage +3. Your spells cost (1) more. This card fits perfectly in Archmage Vargoth Quest Mage. Up to 108 damage from Greater Arcane Missiles. Might be OK, but both blizzard and flamestrike cost too much and would love to be combined with this. 5 mana AOEs hurt own minions. So.... what's left? arcane explosion, shooting star, the cold spell .... i doubt that's worth it. 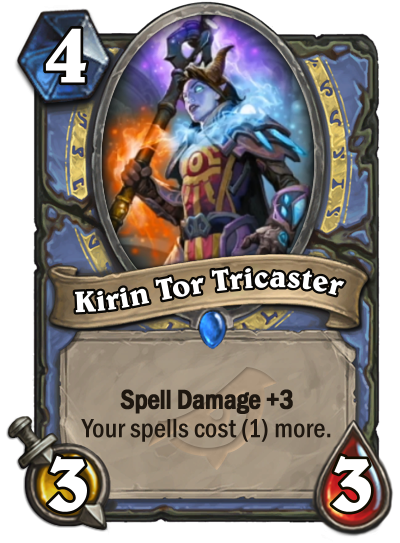 There are probably no consistent applications for this just yet, but Spell Damage +3 for 4 should not be joked with. This card singlehandedly turns Arcane Explosion into a 3-Mana Flamestrike. This will be fun to play even if it's not Constructed worthy. I like the design of it, even if it doesn't turn out to be all that good.